Tourist Refund -Tax Free Shopping - can you buy in the airport? Blog Home > Tourist Tax Refund > The Tourist Refund Scheme with Tax Free Shopping – how, where and why? The Tourist Refund Scheme with Tax Free Shopping – how, where and why? The traveler can often get a Tourist Refund of the tax he pays on his shopping when travelling abroad. This system is very common in Europe, where many visitors from Asia take advantage of this refund scheme. In which countries can you recover this local sales tax? Better known as VAT, IVA or GST. To track down the various Tax Free shopping rules for your destination, just search our global Tax Free directory for all the relevant locations. The rules vary depending on where you live, where you travel to and what you buy. Another key thing is to understand the difference between Tax Free and Duty Free shopping. This is important, because 90% of the time and certainly in most of Europe, you cannot get the tax back on cigarettes, tobaccos or cigars. The same applies to wines and spirits in many Countries. So, when it comes to the Tourist Refund Scheme, there is no such thing as “The Duty Free Refund”, as it is sometimes described. Duty applies to Liquors or tobaccos and it is very rare to get a refund of the Excise Duties levied on these products*. VAT Tax refund in Bangkok airport…. but watch out for the queues to get your cash back! What we are really talking about, is getting the tax refunded on big-ticket items like mobile phones, computers, cameras, fashion items or luxuries like watches, jewelry or handbags and leather goods. But, these refunds can be big, because the price is often high. In Europe it could be 20%+ of the price you pay in the store, a big saving on that iPhone 7+ or a Gucci handbag. One of the big surprises for the Tourist is in the USA and indeed you can get your tax back in the United States, or at least in two States we know about. 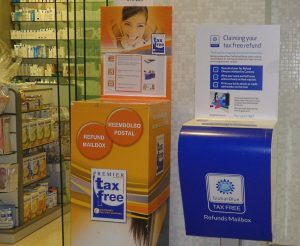 The States of Louisiana and Texas both operate a Tax Free Shopping refund service and many major Malls have refund booths ready for their visitors. Meanwhile in another state, the Philadelphia Tax Free shopping scheme, appears to be slightly different and only applies to shoes and clothing. This state used to have a Tax Free website, but it seems to have disappeared now. The upside to refund shopping is that you can find a much wider variety of stores to shop in downtown and a big range of brands and products. The downside is understanding the different rules for each location and actual refund process. With normal airport Duty Free shops, the tax is already deducted for you, this makes life much simpler. But the range and time you have to spare is limited. The big downside for Tourist Refund shopping can be the long lines at the airport to recover your cash. London is a huge shopping destination, but at Heathrow airport the refund lines can snake around the Terminal at peak times. Clearly, every tourist must decide what they wish to buy, where and how, our top tip is always to research in advance and check before you fly! Previous Previous post: Is the shopping on Cruises Duty Free prices or more costly than normal? Next Next post: Useful Travel Sites for Duty Free Shoppers, check before you fly!